Just typed this all out and went to upload and lost it. Hopefully this works again. On a mad quest to empty bins in the shop this week! So when you got full bins of squares you make BIN POPPERS! These weigh just about 1oz unfinished, so should be around 1.5oz finished, screw eye or easily through drilled for wiring! NEW FACEBOOK PAGE! Like us at: https://www.facebook.com/Saltyswoodlures We will be posting more and more there! Have been putting some neat pics there from in the shop already! The 2019 RISAA Show is fast approaching and we’re in contact with them to do a seminar this year! This is one you will not want to miss! Plug Building 101- You can make great lures too! 3 Oz DAHTAH KITS are returning….should be ready as time permits sometime around the RISAA show or thereafter. Started cutting blanks today! In addition, Ed Bauries has a GREAT page dedicated to this lure on his Antique Florida Lure website at: https://oldfloridalures.com/phillip-porter-dalton/ GREAT history read and I invite you to check it out! 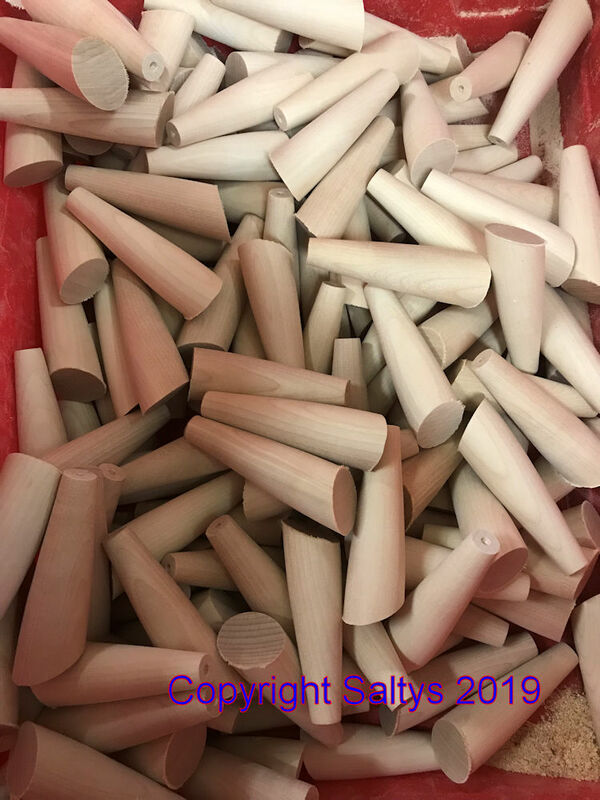 Stay Tuned more to come for 2019 from Saltys! Re: Bin Poppers...Dalton Special..All new... Like us on Facebook... and the D word! Comments from beta testing in Florida...untouched except for location removed. “First cast into a pocket along the shore of ####### Island got a 22" snook; hooks are good. Action is GREAT; sputters great. Sits at an angle with the rear hook down just right for a fish to get. It works great as a sputterbait; works good as a walk-the-dog bait. Noisy. We needed that because we were in about 3' of dingy water. Got another snook, same size,same place on the second cast. These aren't big fish; just very aggressive. That was it for that spot. Caught one sea trout a little further along and then we decided to move on to fish for sea trout in deeper water; could not get one to come up and went to a jig/gulp. We caught over 50 trout in 8 - 10 feet of water; mostly just at the legal length of 15", enough 16" that we could have limited if we'd kept any. No camera unfortunately... forgot the phone... but I often leave it since $1000 phones don't do well with me, cast nets, salt water and fast boat. I'll get on to test the others soon... but the #2 can't be improved upon. If the rear floats a little higher, may get a little more action; but I doubt it. Balance is perfect. Lure doesn't spin even when retrieving fast; very stable.